Which Is the Best way to Build a Garden Office of Wood? The trend to working in a garden office, also shortly called “shed working” is still strong and increasing in the United Kingdom. With so many people becoming self-employed, with so many office jobs connected by the internet or by company owned networks, the good old office job – it seems – is getting more and more obsolete and fewer and fewer employees favour the daily commute to a working place at an office when working from home is as easy as it is and is even proven to be more efficient and productive. Many start their careers as homeworkers in some crammed space, an extra desk in the bedroom, or even on the sofa of the living room, but the more the independence grows the more the wish to have a separate, clearly defined space for working increases with it. This is the point where a garden office comes into the picture as a way to create an own working space without reducing the space at home, a space, which is easily accessible but not part of the busy and distracting every day life of the home. With our smallest garden offices starting at around £1,500.00 and a huge range of garden offices below £2,000.00 it gets very easy to figure out after how many months, sometimes not even years the costs of installing the garden office will have amortized by sparing the costs and the time for the daily commute not to speak about the risks and the strain on health by stress and time pressure. Instead of fighting through heavy traffic you might have an extensive, relaxed breakfast followed by a little walk in casual attire to your own garden office. Of course, this is only for people who have the discipline to go to work and be productive even if there is no boss on their backs. There might also be possibilities to offset a garden office against corporation tax, or other options. Try to enquire about these at your local authority, so you can be sure to file your tax returns correctly. Our range of garden offices starts at around £1,500.00 for small units, suitable for a single workstation with a desk, an office chair, maybe also a sofa and a water boiler for some herbal teas from the surrounding garden during the breaks. Going up to around £12,000.00 for buildings that could contain several workstations, a separate conference room, or an exhibition you can choose from all sizes, designs and floor plans to meet all the needs for your business from a single confined space for you alone to multiple workstations and customer traffic. 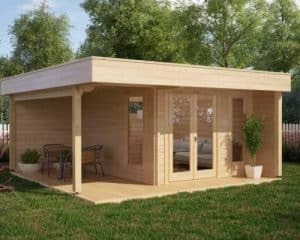 Our garden offices offer a high quality, made from Polar Spruce, kiln dried, with wall thicknesses between 28mm to 70mm, depending on the size of the building. Sturdy, quality controlled constructions with a five-year warranty, double glazing easy to insulate and heat for all year round usage. For the value of your property a garden office on the property will enhance its value by 10 to 15%. With a value for money that high, what is stopping you?